The Dyson V6, V7, and V8 are not your average cord-free vacuums or at least not what you would think of when you hear that term. You might think a cordless vacuum would have little suction and not be able to run long on a full charge, and this was the case just a short time ago. The technology just wasn’t able to put out a machine that could do anything other than clean up small messes. However, Dyson has completely changed that but that is not surprising as they are constantly re-setting the industry expectations. How exactly did they do that with their V Series? The technological advancements all start with the motor and batteries. The power-dense motor uses what is called ‘digital pulse’ with an internal magnet to spin at an almost unheard of 110,000 times per minute. This generates quite a bit of suction in such a small body. In fact, the all new V8 has completely revamped internal electronics when compared to their prior generation of cord-free models. The result is more efficiency and power without the addition of extra size or weight. And when this is coupled with an all new lithium ion battery, you end up with less fading and longer run time. The highest end vacuum can run for around 40 minutes on a full charge. Dyson is well known for their quality HEPA filters that can capture more than 99% of allergens like dust mites, pet dander, and mold spores from the air. The V Series uses a 2 tier radial design that is similar to their larger upright cleaners but on a smaller scale. There is also a post motor filter on some of the models that is specifically built to trap tiny dirt particles. As the air passes over the cyclones and through the filter these particles are removed so the air that comes out is much healthier than what goes in. You can use any of their cordless models in either the handheld or stick mode by adding/removing the extension tube via the click of a button. All of the attachments will work on either, allowing you to clean all the way from your floor to ceiling and everything in between. The accessories include various dusting brushes, crevice tools, hard floor tools, and even a turbine tool (on their Animal models) to pull pet hair out of furniture and bedding. A flexible extension hose also lets you get behind things that were not previously possible. This lineup is very lightweight and portable, especially in handheld mode. You can take it out to the car to get the seats and carpets clean in no time. V6 vs V7 vs V8? 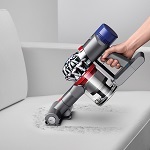 Determining which Dyson cordless model is best for your home really comes down to comparing the attachments and overall power of the motors. All of them quickly convert to handheld and they range from the basic V6 which works well on hard flooring all the way up to the top of the line V8 Absolute which can handle just about anything you throw at it. Take a look over the features listed above and click here if you want to compare pricing at our recommended supplier. You will be able to read consumer reviews as well, to really get a good idea what other people who have purchased one really thinks of it. 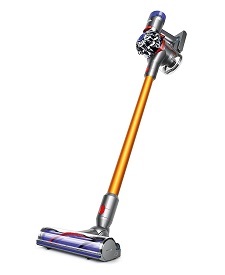 You will quickly find out that as far as cord-free vacuums go there is nothing that can compare to the V Series from Dyson.